The Mazda RX-7 is a sports car produced by the Japanese automaker Mazda from 1978 to 2002. The original RX-7 featured a twin-rotor Wankel rotary engine and a sporty front-midship, rear-wheel drive layout. 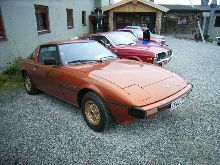 The RX-7 was a direct replacement for the RX-3 (both were sold in Japan as the Savanna) and subsequently replaced all other Mazda rotary cars with the exception of the Cosmo. 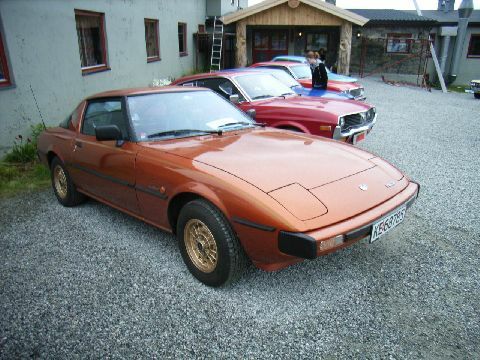 The original RX-7 was a sports coupé. The compact and light-weight Wankel engine or rotary engine is situated slightly behind the front axle, a configuration marketed by Mazda as "front mid-engine". It was offered in America as a two-seat coupé, with optional "occasional" rear-seats in Japan, Australia, and other parts of the world. The RX-7 made Car and Driver magazine's Ten Best list five times. In total, 811,634 RX-7s were produced. Series 1 (1979–1980) is commonly referred to as the "SA22C" from the first alphanumerics of the vehicle identification number. 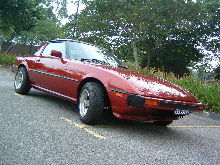 This series of RX-7 had exposed steel bumpers and a high-mounted indentation-located license plate, called by Werner Buhrer of Road & Track magazine a "Baroque depression." In 1980 Mazda released 3000 special models known as the LS (Leather Sport). This package added an LS badge, full leather upholstery, sunroof, and gold-colored alloys. This model was only available in three different colors Aura White (1250 made), Brilliant Black (1250 made) and Solar Gold (500 made). Series 2 (1981–1983) had integrated plastic-covered bumpers, wide black rubber body side moldings, wraparound taillights and updated engine control components. The GSL package provided optional 4-wheel disc brakes, front ventilated (Australian model) and clutch-type rear limited slip differential (LSD). Known as the "FB" in North America after the US Department of Transportation mandated 17 digit Vehicle Identification Number changeover. 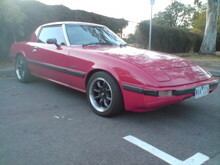 Elsewhere in the world, the 1981-1985 RX-7 retained the 'SA22C' VIN prefix. As a result, enthusiasts outside North America never picked up the "FB" nickname. The license-plate surround looks much like Buhrer's "Styling Impressions." Series 3 (1984–1985) featured an updated lower front fascia. North American models received a different instrument cluster (the NA S3 RX-7 is the only rotary-engined car to not have a centrally mounted tachometer). GSL package was continued into this series, but Mazda introduced the GSL-SE sub-model. The GSL-SE had a fuel injected 1.3 L 13B RE-EGI engine producing 135 hp (101 kW) and 135 lb·ft (183 N·m). GSL-SEs had much the same options as the GSL (clutch-type rear LSD and rear disc brakes), but the brake rotors were larger, allowing Mazda to use the more common lug nuts (versus bolts), and a new bolt pattern of 4x114.3 (4x4.5"). Also, they had upgraded suspension with stiffer springs and shocks. The external air-oil oil cooler was reintroduced, after being dropped in the 1983 model-year for the controversial "beehive" water-oil heat exchanger. The 1984 RX-7 G has an estimated 29 highway miles per gallon (8.11 litres per 100km) /19 estimated city miles per gallon (12.37 l/100km). According to Mazda, its rotary engine, licensed by NSU-Wankel allowed the RX-7 G to accelerate from 0 to 50 (80 km/h) in 6.3 seconds. Kelley Blue Book, in its January-February 1984 issue, noted that a 1981 RX-7 G retained 93.4% of its original sticker price. The handling and acceleration of the car were noted to be of a high caliber for its day. This generation RX-7 had "live axle" 4-link rear suspension with Watt's linkage, a 50/50 weight ratio, and weighed under 2600 lb (1180 kg). It was the lightest generation of RX-7 ever produced. 12A-powered models accelerated from 0–60 mph in 9.2 s, and turned 0.779g (7.64 m/s²) laterally on a skidpad. The 12A engine produced 100 hp (75 kW) at 6000 rpm, allowing the car to reach speeds of over 120 mph (190 km/h). Because of the smoothness inherent in the Wankel rotary engine, little vibration or harshness was experienced at high rpm, so a buzzer was fitted to the tachometer to warn the driver when the 7000 rpm redline was approaching. The 12A engine has a long thin shaped combustion chamber, there is a large surface area in relation to its volume. So combustion is cool, giving few oxides of nitrogen. However, the combustion is also incomplete, so there are large amounts of partly burned hydrocarbons and carbon monoxide. The exhaust is hot enough for combustion of these to continue into the exhaust. An engine driven pump supplies air into the exhaust to complete the burn of these chemicals. This is done in the "thermal reactor", chamber where the exhaust manifold would normally be on a conventional engine. Under certain conditions the pump injects air into the thermal reactor and at other times air is pumped through injectors into the exhaust ports. This fresh air is needed for more efficient and cleaner burning of the air/fuel mixture. Options and models varied from country to country. The gauge layout and interior styling in the Series 3 was only changed for North American versions. Additionally, North America was the only market to have offered the first generation RX-7 with the fuel injected 13B. A turbocharged (but non-intercooled) 12A engine was available for the top-end model of Series 3 in Japan. Sales were strong, with a total of 474,565 first generation cars produced; 377,878 were sold in the United States alone. In 2004, Sports Car International named this car #7 on its list of Top Sports Cars of the 1970s. In 1983, the RX-7 would appear on Car and Driver magazine's Ten Best list for the first time.